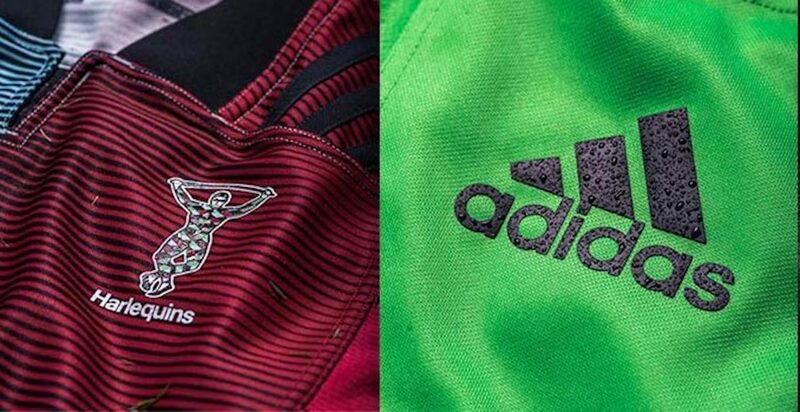 Harlequins and Adidas have officially released the clubs 2018/19 kits for general sale. This year’s home shirt celebrates the “swagger” of the Harlequin, the Jester that has been the Club’s motif and brand for over 150 years. He shows confidence and self-assurance and always captures the imagination. The shirt is forward-thinking in its modernity and technology while always paying homage to the history that Harlequins has fashioned. The theme of the away kit is Menace. Again, it speaks to the menacing yet playful character that is the Harlequin jester. The traditional themes run through the away kit too, with the skewed midnight black quarters on the shirt with a green base and grey shorts and socks. Harlequins’ new home and away kits are available to buy today from shop.quins.co.uk and in the Club store from Monday 9th July. Order today and receive FREE standard delivery until Sunday July 15th. All orders will be dispatched within 24 to 48 hours of purchase. Our training kit launched in June and is available online and in the Club store too. Harlequins have also confirmed they will be launching a revolutionary charity shirt in October.